ReCycle is the Cycle Studio with a Difference! The PeachyKeen Bicycle Powered Cinema can be ‘popped up’ anywhere and everywhere. Running from 100% human power there is no mains electricity required! The ultimate activity to inspire every film buff, sports fanatic or even those couch potatoes. We hook up one of our PeachyKeen Pods to a projector and the challenge is to generate enough energy to keep the entertainment on screen. You can choose the movie, big game or educational message. With our help, you provide the human power! We provide all the equipment for the ‘Hollywood Experience’ and can even generate enough energy to power a TV in the middle of a field with a signal from an aerial installed in the Gazebo roof. 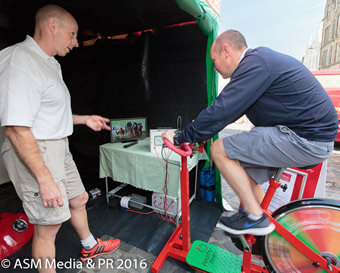 Click here to enquire or to find out more information about our bicycle powered cinema. We have a whole host of water based activities. Click to find out more. Using a popular electric model car racing set, we can explore how energy can change state! Understand the power of light with our illumination activities. 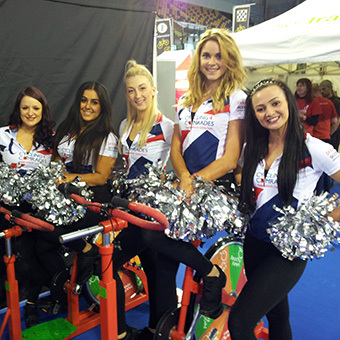 Watch your favourite TV programme with the power of cycling! PeachyKeen utilises blenders and food possessors to enable participants to make a smoothie(s) in seconds. "We have had the privilege of working at education related events where we combine engaging activities, using a range of PeachyKeen resources." STEAM ahead with young ideas…!! !